So, your kid is about to go to college, and the packing list you received lists “first aid kit” as a necessary item. 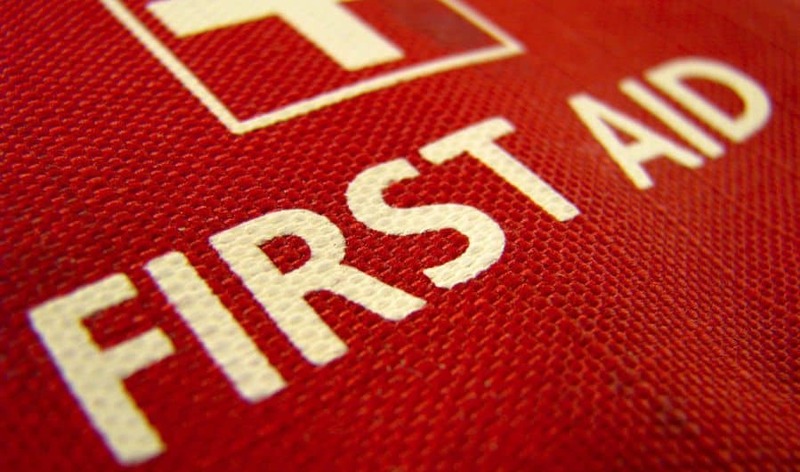 If you look in the stores, or online, you’ll find there is no shortage of prepackaged first aid kits out there, all ready for you to take the one-and-done road. I am here to tell you that’s a terrible idea. Never buy the ready-made kits. Why? First of all, although I guess it saves you some time, they’re almost always more expensive than putting a kit together yourself. Second, the time savings is moot if the kit doesn’t contain what your kid needs, and most of the time, it doesn’t. It has 2 individually-wrapped doses of Advil that’ll be gone before the first week of classes wraps up, but it also has, say, those tiny steri-strips designed to hold together a deep cut (which will still be fossilizing in said kit when your grandchildren are getting ready to go to college). 2) Also include a cheat sheet, because they’re not listening while you’re having the above conversation. Part of the reason I like to use a metal lunchbox is because it’s sturdy and doesn’t look like anything else they’ve packed (read: they can find it easily and it will survive even if they’re careless with it), but also because I can tape the cheat sheet inside the lid (which is attached and cannot get lost; if you choose to use a shoebox, try to find one with a hinged lid so it doesn’t walk away). 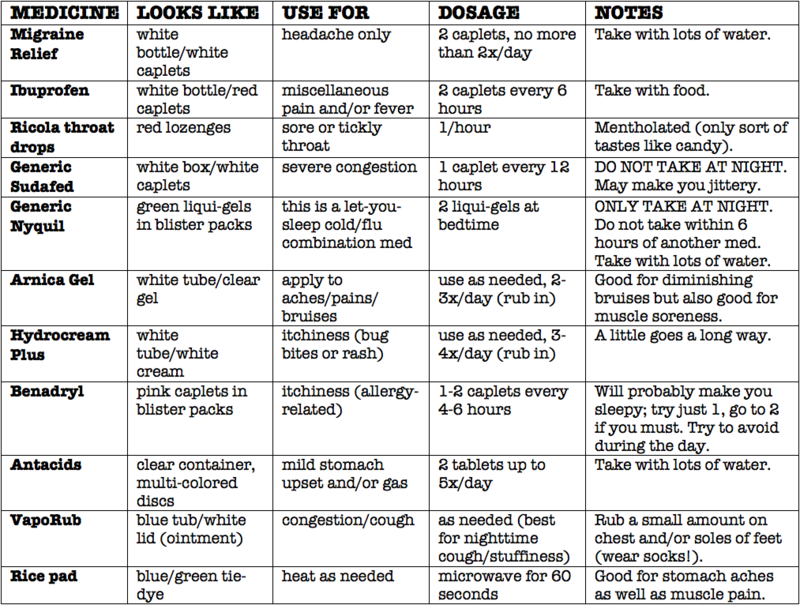 Click here to view the cheat sheet included in the kit I just finished making for my youngest. Thermometer: Get a decent electronic thermometer (spring for the “fast read,” if you can, but do not get a forehead or in-ear model, as they’re less accurate in inexperienced hands) and check the battery before you pack it up. The battery in my son’s brand-new thermometer was dead on arrival, so I’m glad I checked! You can talk your kid through what constitutes a low fever vs. scary fever, but I mostly include this so that when they call to say they’re sick, I can ask them about their temp and respond accordingly. Chewable antacids: Antacid tablets are good for mild stomach upset and they’re loaded with calcium. As medication goes, it’s benign, but it’s good to have around. General oral fever reducer/pain management: I like ibuprofen for this purpose but some people prefer acetaminophen. Talk to your child and include on your cheat sheet any relevant information about these meds, like that Advil can be hard on your stomach and Tylenol can be hard on your liver. Anti-itch treatments: I include both hydrocortisone cream and Benadryl tablets, as both my kids have a lot of allergies and (even with their various allergy meds) are prone to itchiness. If this isn’t something you tend to need/use at home, consider including a topical option, anyway. Dorms tend to be itchy places! Sore throat/cough lozenges: This is a simple and cheap item to procure when they need it, of course, but they will be really grateful to have it on hand when the need arises, I promise. Whatever cold meds you typically use: This is going to vary depending on what you like, and that’s fine. Also bear in mind that many cold medicines can be abused, and it’s worth a conversation with a medical professional and a dialog with your student before including the “heavy duty” stuff, here. I find the inclusion of a “get-a-decent-night’s-sleep” type of cold/flu med (as well as whatever they might want for daytime) a must-have, but my kids will be the first to tell you I have lectured them ad nauseam about the safe, occasional use of these meds. Do note that pseudoephedrine is now a behind-the-counter medicine you must be 18 to purchase, so if your freshman, like mine, is still underage, include plenty of Sudafed if they use it—they will not be able to buy more for themselves! (And if you don’t typically use that already, skip it.) We also like the put-VapoRub-on-your-feet-at-night method during cruddy colds, so I also include some of that. Topical pain reliever: I don’t consider myself super-crunchy, or whatever, but we really have had good results with arnica gel both for bruising and general soreness. I always make sure the kids have it. Topical antibiotic: It’s not included on my cheat sheet because my kids keep their Neosporin in with their toiletries (did you know acne heals faster if you apply a healing agent over your zit medication? ), but even treated Band-Aids may not be enough to keep infection at bay with a big cut or abrasion. A generic tube is a couple of bucks and they can smear it on anything that looks suspicious. Probiotics: If your kid is prone to stomach issues but isn’t already using probiotics as part of their daily regimen, consider including some with instructions for use during times of tummy distress. “Real” stomach meds: Similarly, you may want to include some Kaopectate or Pepto for the times when those chalky antacids just won’t cut it. Microwaveable rice sock or pad: A heating pad is bulky and a hot water bottle can be messy. I sprung for a couple of cute ones from Etsy, but you can make your own with rice and a sock and presto, you have a microwaveable heating pad. Instant cold pack: If your kid doesn’t have a fridge where you can stash a regular ice pack, consider instant cold packs for the first aid kit. Plan B: Again, I realize not everyone is going to agree with me on this, and everyone is free to make their own choices. My choice is to have done some research and purchased a little stash of generic Plan B pills and my kids each have one in their first aid kits. My son will obviously never take one and I doubt my daughter will, either; the deal is that they have it, and they are free to use it themselves (in the case of my daughter) or share it, and I will replace it at any time, no questions asked. With a little bit of time and thoughtfulness, you can put together a first aid kit for your college student that will give you both some much-needed peace of mind. Don’t be afraid! You’ve got this. Alcohol wipes, individual package kind too. Sun block and mosquito repellent (which is not really a first aid kit supply, but I wanted to mention it). I always put together my own stuff, even in high school working at summer camp for 9 weeks.